Early start on the day. Six o’clock the alarm goes off. We’re going trekking today. Yesterday we found a free group trek on Sundays here in Chiang Mai. We have no idea about the quality of the trek, the people organizing or who attends, but we want to go trekking. We have breakfast in room with the muesli and milk plus a banana. Energy for a few hours right there. Then we take off on the motorbike. It’s quite a chilly drive and we do it with jackets on. Like the locals we’re dressed for it. Me with my backpack in front and Katja shivering behind me. It’s about a hours drive to the meeting point, but with Google maps and local SIM card is no problem to find it. There’s a big group there already and we soon meet Pam that will lead today’s trek. We gather up in two different taxis and take if toward the starting point. Inside the taxi we find that there are really lovely people in the group. Americans and Germans mostly, but also a couple of locals. The driver wants to get back down to get in line again for more business and show off really creative driving. We’re climbing uphill and he takes the curves at a speed so the tires screeches. I’m not one to get car sick, but this ride took its toll, all 50 minutes of it. For more than fifteen minutes after the ride I feel the acid burning in my throat, but manage not to puke. Watta ride! The trek start easily enough with a walk through the jungle on a paved road. We get up to the view point and look out over a morning foggy Chiang Mai. The jungle are so full of sounds. There are bugs and animals that makes it sound like a saw mill. Screeches from birds is heard, but no animal of any size is seen. We walk through the jungle for about two hours before we come to a little Hill tribe village. As everywhere else there is coffee and sodas to be bought. We enjoy a cup of rock solid pure black mountain hardened coffee. Yummy. Off we go again and now the group split up. We’re twenty six in total but someone, I think it was Bruce, forgot his walking stick at the coffee place and had to go back. About eight stay in the group behind as the rest of us, under guidance of Pam, move on. Pam is Thai, but she’s not from Chiang Mai originally. She’s got a keen eye for details though and spot several cool beetles and bugs that we look at and take pictures of. No snakes today, luckily. There are, including water snakes, about twenty eight lethal poisonous snakes in Thailand out of around 240 some different snakes in total. At lunch one of the older Americans show off a snake venom drainage kit he’s got. It’s used if you get bitten to duck out as much poison as possible. He gives it as a gift to Pam, as she’s often the guide on these tours. This way it may benefit anyone at any time. We have lunch at a place called Five way junction. It’s a crossing where five paths leads in different directions. We leave an arrow on the ground for the group behind, but they have Kurt in the group that will see then safe down. It’s a few hours more of telling before we get to the beautiful tree. It’s really cool like something out of Star Wars or Alien. Now we’re almost down at the temple of Doi Suthep temple. Just a short trek through the last of the jungle and we’re amidst taxis and tourists again. This temple it’s a must see here in Chiang Mai, so I guess we’ll drive up another day. Right now we’re not dressed appropriately for a temple visit. We’ve walked for five hour and forty minutes. A good hike through the jungle. A few in the group say goodbye and take the taxi down to the starting point, the rest of us tag along after Pam to a little restaurant. We eat a little and share a beer between us while talking about nothing and everything with the people at our table. When it’s time to leave we’re six people going together and need to wait to fill the taxi with ten people. We could pay our way down by paying for ten, but we wait about five minutes and there’s enough to take off. The ride down is smoother than the crazy ride up this morning. Probably because this was the drivers last tour. It’s almost three thirty and he’ll be at the back of the line to go back up. We talk to Pam about joining in on a harder more exploring trek on Wednesday. We’ll see what her partners say about that. We get on the bike and start on our drive home. I’m quite tired, but getting on the seat of the bike I wake up and when the wind cool us down I’m wide awake again. We don’t get far before it start dripping rain. We put on the jackets again and now we have to keep moving. Stopping while wearing jackets is melting hot, so it’s a matter of planning to keep moving towards the red lights. The red lights last forever here in Thailand as it’s normally one way at a time. That means you have three times as long red as green light. Patient is a virtue here, but they practice “Left on red when safe” that takes away some of the frustration. Dinner is eaten at the little restaurant we visited for fruits yesterday. 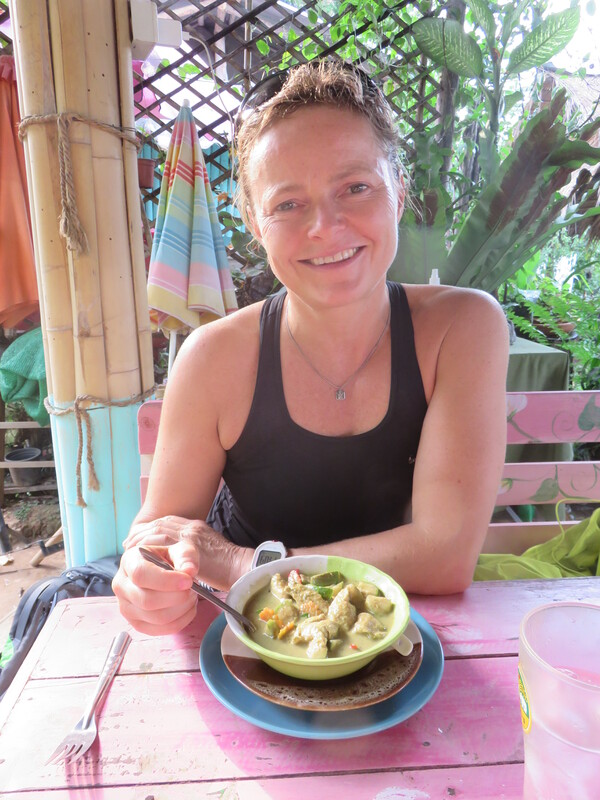 Katja’s green curry is maybe the best we’ve tasted in Thailand. One small spoon it’s enough for my eyes to water and throat to burn. Katja enjoys every bite. From there we wanted a cup of coffee and maybe a cake, before going home. It’s not late enough to go to sleep, so a little wake-up-call would be good. We stop at the place right next to our hotel we ate the first day. We’re a half hour before closing, but it turns out they’ve already cleaned the coffee machine. Guess there’s but that much business here on a Sunday afternoon. We do get cake though, as a consolation prize. Like I wouldn’t have had cake if they had coffee. Riiiiiight. At the hotel we only got cold water in the shower. Nice. NOT! After such a day I would like to revel in hot water for a hour if I could. We shower and jump under the duvet to get warm again. From there we googled, emailed, downloaded pictures and nice movies from Mandirigma camp, blogged and then watched a little tv. We turned off the lights at nine and I don’t think I was awake at nine oh one.